Our commitment to your fitness starts the second you walk in our doors. We have proudly represented Lowell and the surrounding area since 2012. Since that time, we have worked with countless athletes of all shapes, sizes, ages and fitness levels. No matter your fitness level our expert coaches can tailor each workout to fit your needs. 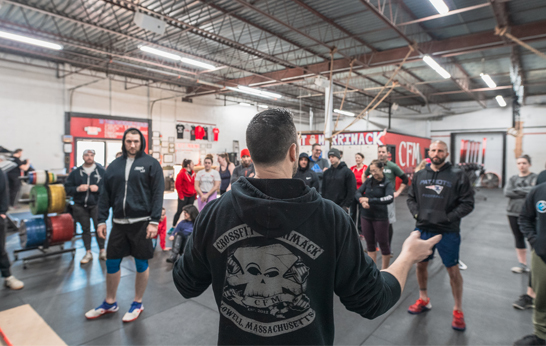 In addition to our phenomenal team of CrossFit coaches we are one of the only gyms to offer specialized running programming and strength training in New England. Lead by former American record holder, US champion and 2008 Olympian Anna Willard. Our Gorham Street location in Lowell is one of the largest CrossFit facilities in the North East with close to 6,000 sq/ft of fitness space! All of our space was custom built to fit the needs of our athletes from top to bottom. Come see for yourself just how it fits. Running is much more than one foot in front of the other! The biggest weakness and cause of injury for most runners a lack of strength. We understand everyone’s fitness routine is different. That is why we offer separate strength classes and race specific programing lead by 2008 USA Olympian Anna Willard Grenier. Learn speed generation, power, balance, injury prevention, rehabilitation and overall proper running mechanics. Take things up another notch with your own individualized running programming!